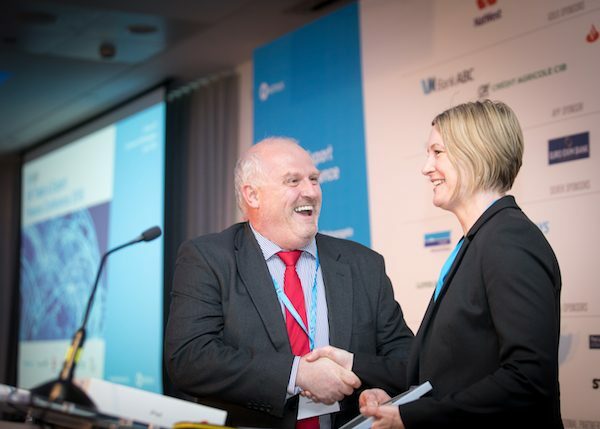 On 7 June 2018 we hosted our 8th Export Action Plan competition final at GTR’s UK Trade and Export Finance Conference in London. Once again it featured 10 inspiring SME companies looking to fly the flag for the UK. Pitching for the £3000 cash sponsored by NatWest and further e-commerce and export support from The Institute of Ecommerce and The Institute of Export & International Trade the 10 shortlisted companies gave presentations showing how they’d use the cash to implement their plans for international growth. The judging panel consisted of Jim Bidwell (Head of Trade Services Product Management – NatWest), Emil Stickland (CEO, Thrive Digital and the Institute of Export & International Trade), Terry Scuoler (Chairman, The Institute of Export & International Trade), Anne-Marie Woolley (Trade Finance Consultant, Bank Leumi), and David Weatherhead (Head of SME Trade, Lloyds Banking). They had been invited to the final having submitted their completed Export Action Plans using our online planning tool. There was no set theme for this competition, as companies from all over the United Kingdom and from all sectors were invited to enter. You can view all photos from the final here. The judges for the 8th Export Action Plan competition final. 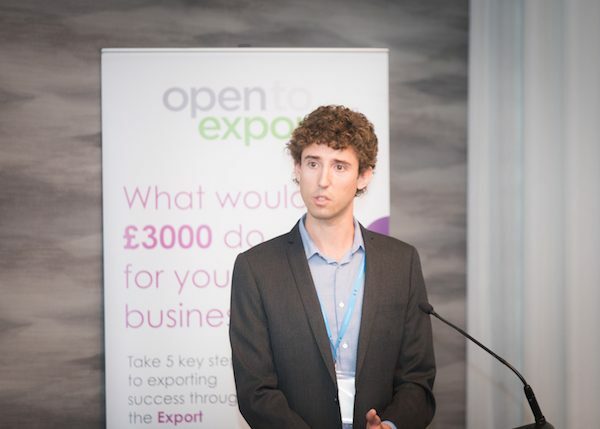 Companies from far and wide, ranging from breweries in Scotland to PVC flooring from Luton, travelled to showcase their export plans at the final in London. 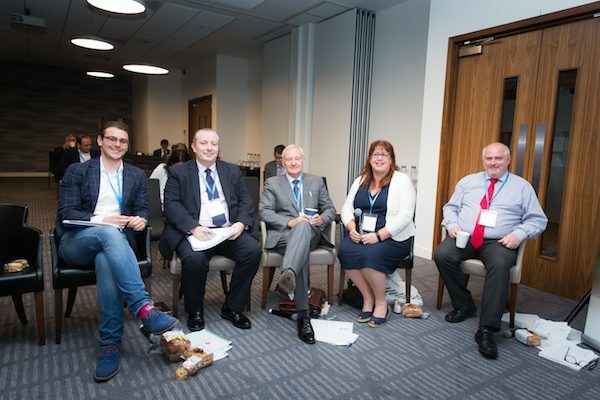 The final was taking place as part of the UK Trade and Export Finance Conference run by Global Trade Review (GTR). Welcoming close to 500 delegates from across UK industry, the conference is an annual highlight for domestic exporters, financiers and trade specialists. It featured a broad array of workshops, panel discussions, and keynote speeches from representatives at major banks and international trade organisations. The final itself began after lunch with Lesley Batchelor (Director General at The Institute of Export & International Trade) welcoming the finalists, judges and interested conference delegates. Sue Burns from Bubblebum was first to pitch, having travelled in the morning from Northern Ireland. Bubblebum manufacture a multi award winning inflatable car booster seat range and pitched for the £3000 to go towards a significant campaign to enter the German market. We then saw cutting edge British engineering on show with Dan Walker from Diamond Hard Surfaces and Lucinda O’Reilly from Ecotile Flooring. Diamond Hard Surfaces provide surface engineering solutions to high endurance applications of a unique diamond based material in Adamant™, which gives extended life in high temperature, chemically aggressive and abrasive environments. Ecotile Flooring produce high quality and durable PVC flooring suitable for industrial use and are looking to increase their exports through an international SEO campaign in Germany and by generating more sales for their US distributor. Daniel Walker from Diamond Hard Surfaces makes his case for the £3000 cash prize. The finals always feature a quirky variety of SME exporters and the 8th iteration was no different. For instance, we went from a gluten free, vegan and allergens-free range of bakery products from the Incredible Bakery Company (Valeria Mizuno-Taylor), to fertilizers and bio-stimulants from Levity Crop Science (David Marks) at one point. Incredible Bakery Company will be exhibiting at the Food and Drink Business Europe in Dublin on 5th of September and intends to start exporting as early as the end of 2018. There were two companies from the fashion industry in Mirelle London (Shaheda Mullholland) and Seekers of Design (Anoesjcka Gianotti). Mirelle London design luxury handbags and are looking to build relationships at trade shows around the world, while Seekers of Design are looking to internationalise their B2C marketplace for independent art, home and fashion designers. Bernadette Mulligan showcased the remarkable 12-month growth she’s had with her relatively new tattoo and brow treatment aftercare products business called My Brow Care, before Mark Lufkin pitched for Wondrwall’s intuitive home tech technology. Both were looking to win the cash prize in order to enhance their social media activity in overseas markets. Last but by no means least, and all the way from Scotland, was Katy Heppell from the Wooha Brewing Company – the latest Export Action Plan finalist from the alcohol industry! Katy sketched out the brewery’s plans to take their award-winning beers to the USA and Southeast Asia, using the ‘Made in Scotland’ mark of quality as a key tactic. The Incredible Bakery Company were one of the multiple finalists that bought samples. 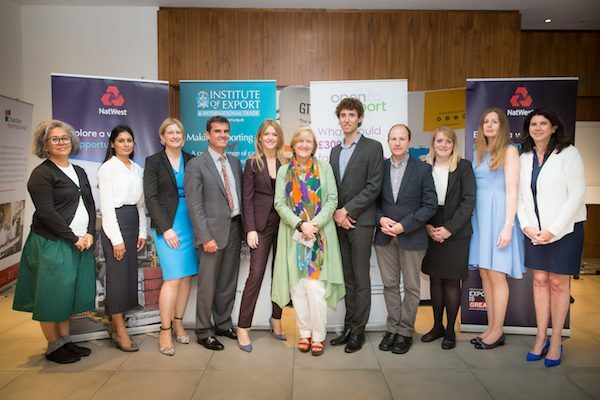 The finalists that make it to the Export Action Plan finals are all winners in truth. 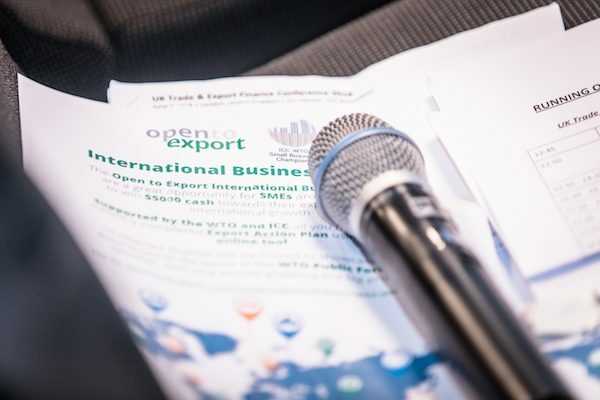 Each wins free business membership with The Institute of Export & International Trade, each have already made it through a thorough selection process to make the final, and the events themselves are always great learning and networking experiences for all involved. However, there can only be one winner of the main £3000 cash prize. Following a thorough deliberation from the judges, NatWest’s Jim Bidell announced BubbleBum as the winners, in front of a packed closing plenary at the conference. It was a brilliant day and of course we are delighted that BubbleBum was selected as winner. The Open to Export plan is incredibly helpful for a growing business like BubbleBum when targeting export markets. Winning the award will make a huge difference for us when applying our export action plan for Germany. The award is an endorsement of our team’s hard work, passion and focus on clear export goals. 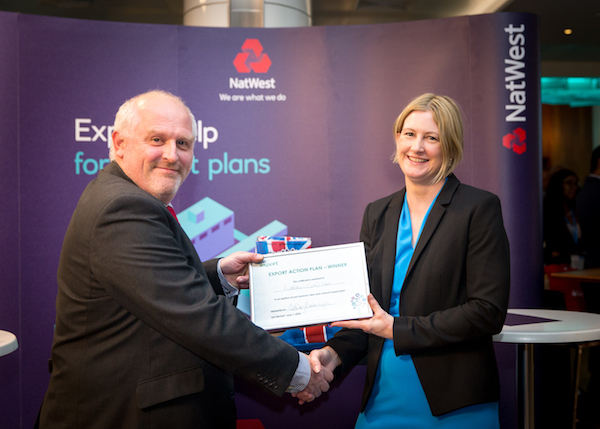 We’re very grateful to the sponsors NatWest and the Institute of Export, but also to our fellow competitors, for an enjoyable competition, and the opportunity to invest in our future export growth. It was another wonderful event showcasing the ingenuity and hard work of Britain’s SMEs. Bubblebum were certainly worthy winners, but it should always be noted that all of the finalists impressed the judges greatly and we all predict great things for them. We’d like to thank the sponsors NatWest, our hosts Global Trade Review, and prize givers in The Institute of Ecommerce and The Institute of Export & International Trade for their hard work and commitment to making the competition happen. With issues of trade now very much at the forefront of the global agenda it has never been more important for UK companies to export. The companies featured here today have a crucial role to play in blazing a trail for other exporters to follow, whilst further showcasing the enviable reputation the UK still enjoys for quality goods and products. Any one of them would have made a worthy winner. And now we move onto our 9th Export Action Plan competition – and our first ever international iteration! 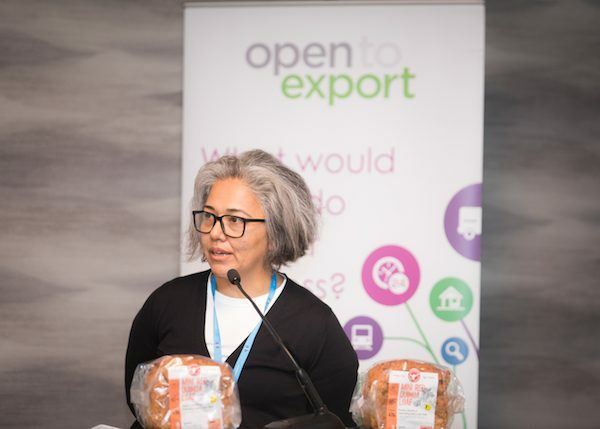 The Open to Export International Business Awards are open to SMEs from all over the world to enter, again using the Export Action Plan tool. The competition is being run in partnership with The Institute of Export & International Trade, the World Trade Organisation and the International Chamber of Commerce as part of the WTO-ICC Small Business Champions initiative. The final will be taking place in Geneva in October as part of the WTO Public Forum. The awards are a great opportunity for a SMEs all over the world to gain global prestige, network with international media, business and governments, and, of course, to win $5000 towards their international strategies. Start your Export Action Plan today and enter the International Business Awards.